The Grand Hotel Excelsior is situated a stone’s throw from Valletta, Malta’s quirky capital. The beautifully appointed rooms feature views across Marsamxett Harbour to Fort Manoel, the soaring citadel built by the mysterious Catholic Order of Saint John. 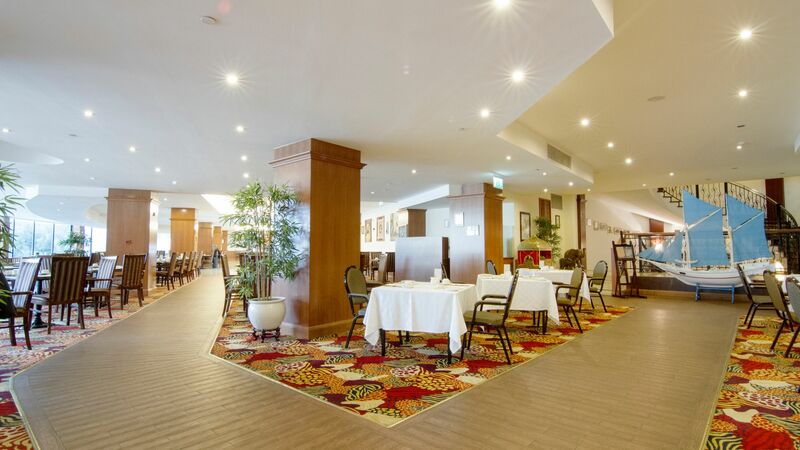 Three excellent restaurants are located onsite, each serving up fine meals in light and airy surroundings. For drinks you can choose from the Tiki Village and Blue Ocean Bar, offering fine cocktails in a brilliantly kitsch setting, and the elegant Harbour View. This is the only hotel in Valletta with its own private beach, where you can dip your toes in the harbour or enjoy a swim in the warm waters. Back on the loungers you can watch the boats sail in to the private marina. Round off the afternoon at the onsite spa and gym, for a steam, massage or energising workout. Classically styled Harbour View is found in the hotel’s grand lobby. Comfortable armchairs and all-enveloping sofas are arranged around the large windows which provide views across to Valletta. This is the place to come for your morning coffee or evening Mai Tai. An elegant restaurant serving à la carte Mediterranean cuisine with beautiful Marsamxett harbour providing the backdrop. The emphasis is on fine local ingredients. Open: 12:00 - 16:00 and 18:30 - 22:00. A charming fourth floor restaurant that’s open for breakfast throughout the week. On Sundays there’s an excellent buffet. Open: 06:30 - 10:30 Monday to Sunday and 13:00 - 15:00 Sunday. 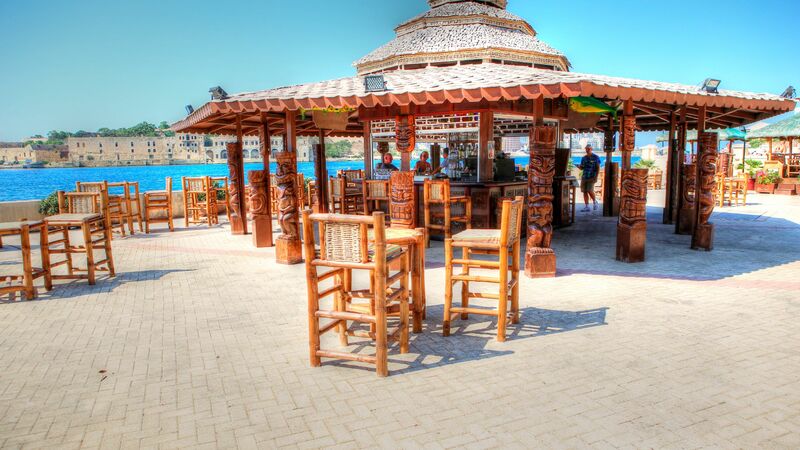 Tiki Village and Blue Ocean Bar is a fabulously kitsch venue located on the harbour’s edge. With its unique Hawaiian styling it’s sure to put you in a holiday mood. The food menu includes salad and freshly grilled fish. Please note, this bar is closed until summer 2019. The hotel’s swimming pool is located on the harbourside. It’s the perfect place for a few morning lengths. The Excelsior boasts the only private beach in Valletta. Loungers and umbrellas are available to relax beside the water. Le Grand Spa features nine rooms, with a wide range of treatments on offer. A steam room and Jacuzzi are available - as is a top of the line gym. 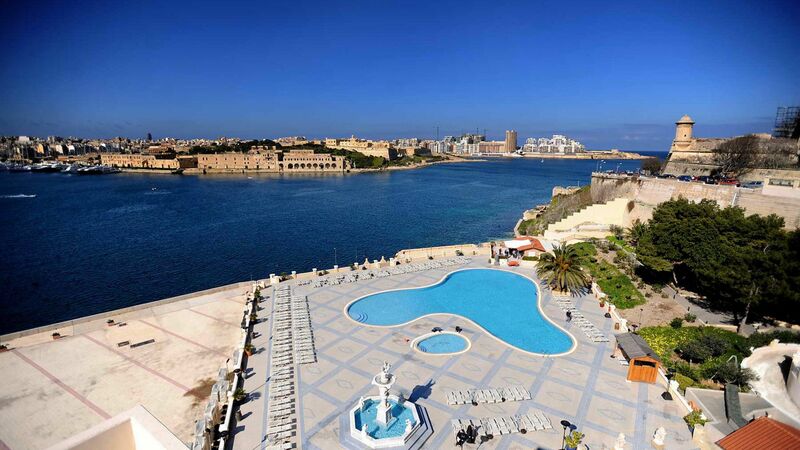 The Grand Hotel Excelsior is situated right on the doorstep of Valletta, facing out over Marsamxett harbour. It’s just a short walk from the heart of the city, where you can wander through the baroque streets, which have been unchanged since the city was founded by crusaders in the 1500s. Around the hotel are some fine lookout points and places to relax, including the Msida Bastion Historic Garden and the Argotti Botanic Gardens. 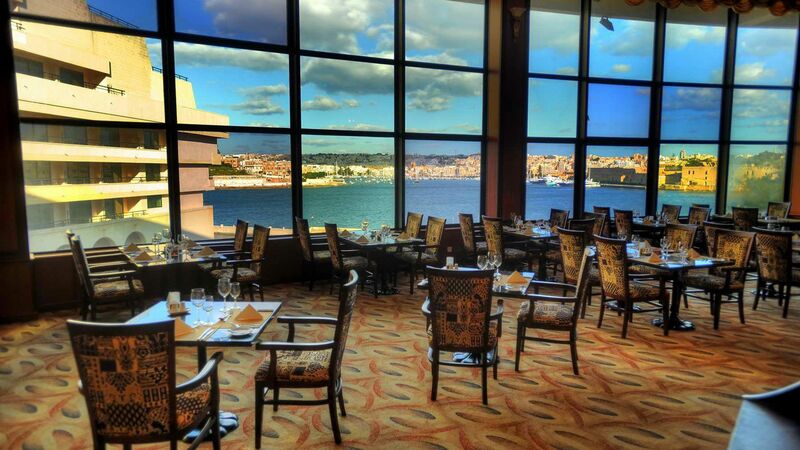 The hotel’s location on the harbour allows for stunning views across the bay. As it’s outside the city’s main grid, travel to other locations around Malta is a breeze. 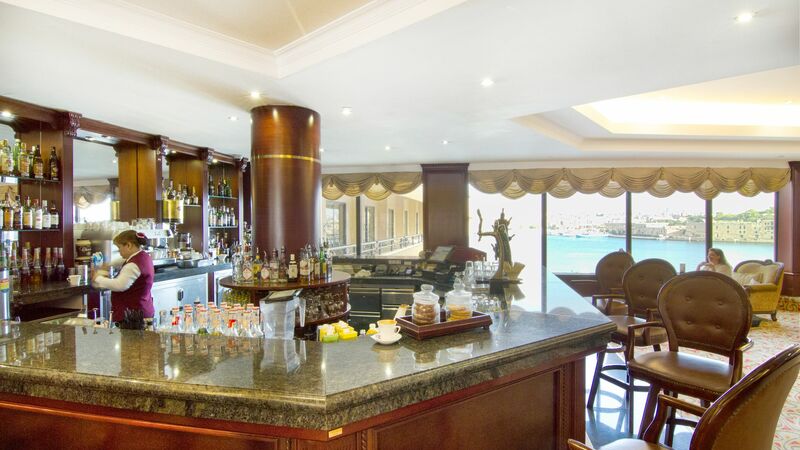 The Hilton Malta is a 15 minute drive from Malta International Airport. Deluxe Rooms with Inland View are located on the 1st - 7th floor and feature king or twin beds and a spacious balcony. Deluxe Seafront Rooms measure approximately 38m² and offer a 180 degree view of the Marsamxett Harbour, Manoel Island and the private yacht marina. Deluxe Seafront Rooms measure approximately 38m² and offer a 180 degree view of the Marsamxett Harbour, Manoel Island and the private yacht marina which can be enjoyed from the spacious terrace rather than a balcony. Superior Deluxe Inland View measure approximately 33 - 38m² and are located on 8th - 10th floor, featuring one king or two twin beds and a balcony with a view over the hotel plaza and the city of Valletta. Superior Deluxe Sea View measure approximately 33 - 38m² and are located on 8th - 10th floor, featuring one king or two twin beds and a balcony with a view over the hotel plaza and the city of Valletta. That might sound obvious but if you are looking for somewhere a bit more personal this is not it. That being said for a couple of nights it worked well. Get a room overlooking water. I booked direct and they upgraded me. 5 min walk into Valletta through City Gate. But it is uphill and there are lots of steps to get out of the property. There is I believe a car available if you can?? ?t walk (but then you will struggle around Valletta...) I can imagine it gets very busy during the summer; in April it was ok, but get down for breakfast early and be prepared for some mixed service there. “ Great location but rooms hit and miss! Hotel is in a great location. It?? ?s a huge place. Staff mainly lovely but have experienced some very rude ones too unfortunately! Only one mediocre restaurant available for dinner - v disappointing given size of this place. Lots of signs for other restaurants but all closed right now with no explanation and hotel fully booked. Biggest annoying thing are the ?? ?garden rooms???. This is what we booked and this is what we are woken up to every morning. The lovely sound of coaches and cars queuing up outside our room billowing fumes. Cannot open balcony window or sit outside. Was offered another room that faced a wall and reeked of smoke as adjacent to hotel service area. Not great at all! We stayed for a 12 night vacation and could not have been happier. Every one of the hotel staff works very hard to make your time here enjoyable. A couple minor issues which aren't worth detailing because it would detract from our overall impression of the hotel were addressed immediately and to our total satisfaction. Our room was cleaned and refreshed daily yet there was never an intrusion. Even when we left our room late it was always made up on our return. The serving staff throughout the hotel are pleasant, friendly and genuinely interested in seeing that you enjoy yourself. Absolutely everyone was delightful from the buffet to the Blue Ocean waterfront bar. If you are planning an excursion or even just a trip that's a bit more than walking distance the tour desk is more than helpful and the price points are very fair and competitive. Special hello to Tony who took us for a great private day trip to Gozo! The hotel itself is a sprawling complex yet not overwhelmingly large. Everything feels easy to access despite the overall size. The grand lobby feels luxurious yet comfortable. The pools, both indoor and out are beautiful. Location-wise, walking into the main entry to downtown Valletta is easy enough to do repeatedly each day. In fact we often returned to the hotel just to drop a few things off or take a quick break only to head back out on our adventures. Note that there are plenty of stairs to climb coming and going but that's typical of Malta in general anyway and otherwise part of the architecture of the hotel's grounds. As far as the room was concerned it was spacious with a large bathroom encompassing both a separate shower and deep bathtub. The balcony was large enough for four people with a stunning view of the pool area, Manoel Island and the Sliema skyline although we understand not all rooms will have this view. Considering we were there for a relatively lengthy stay we had ample closet and storage room for all our clothing and accessories to be out of sight. If you have the time, the spa offers a great array of treatments. The couples massage was a great mid-vacation break to relax after so much walking and hiking. We would not hesitate to return to the Excelsior and want to thank all the staff for making our stay so memorable. We arrived by taxi and our cases were taken by the porter. Our check in was supposed to be by 3pm but it was almost 5 before the room was ready. We had a pleasant drink while waiting. When we got into our room we had 2 double beds pushed together, a great view over the harbour, a large bathroom and a balcony. On closer inspection I noticed a skirting board had come away from the wall, a drawer front had come loose, some fittings were adrift in the bathroom and one of the lights wasn't working. We stayed 2 nights and by the time we checked out, these defects hadn't been addressed. The bed was comfortable but the 2 pillows together still went almost flat. Breakfast was buffet style, had a wide selection and was well cooked. We didn't have main meals in the restaurant but did use room service one night. There is an outdoor pool, an indoor heated pool and a gym to use at no extra cost. When leaving the hotel you have to climb 88 steps to the main road, then it's uphill into Valetta. It was only when we were leaving that we found there is a complementary shuttle service into town. Would I recommend this hotel? Yes, I would stay there again. The staff were very professional and polite at all times. Spent a few nights here while in town on business. My second trip to Malta and the previous trip I stayed at what I assume is a partner hotel in St. Julian?? ?s Bay named the Corinthia. Both hotels have a nice offering of food and bar service on site. The Excelsior looks like it must have been a truly grand place about 20 years ago. That being said, the room was nice and had everything I needed. Internet was strong, room had a queen bed, a large desk, mini-fridge, water boiler for Nescaf?? and a spacious bathroom. Breakfast offering was strong and met all types of breakfast needs you might want. From heavy eggs and meat to fruit, cereal and bread. The location was great because you are a 10min walk from Valetta. This part of Malta is my favorite part. Walking in daytime or night is pleasant especially in March when it is still cool. Overlooking the harbor from the old fort is my favorite spot. All in all the hotel was great and the location in the city was perfect.